Great comforter set!!! My four year old loves it especially since, “Baby Shark! !” phase has hit our house! The colors are exactly as pictured and it is great quality for the price!! Fiercely fun, the Urban Habitat Kids Aaron Comforter Set provides an adventurous update to your bedroom. The 100-percent cotton comforter sports sharks and stripes in navy and green colors that pop on the light grey background. Coordinating shams, in corresponding colors, pair well with the comforter to complete the look. A solid navy reverse adds a bold splash of color, while two decorative pillows with embroidery provide the finishing touches to the bedding set. One pillow features a plush applique shark with the typography, 'Jawsome' and the other screams 'Rah.' in a style that complements the top of the bed. Machine washable for easy care, this awesome comforter set is sure to make a splash in your bedroom. I love Urban Habitat! All the beds in our kid's room have their comforter sets. They are cotton, machine washable and wash great. And, the accent pillows are the perfect final touch. You can't go wrong. Hope you find a style that goes well with your kid's decor and personality. 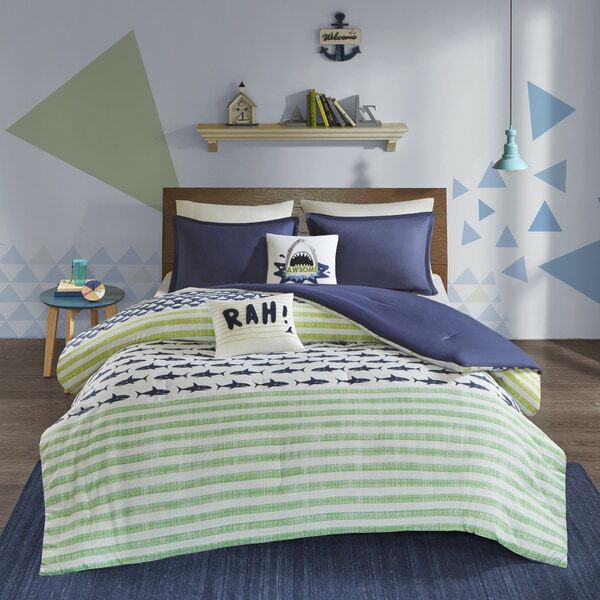 Bought this Urban Habitat comforter set for my grandson who loves sharks. He loved it so much. It is soft and comfy and I like the colors. The throw pillows that go with it are so cute. I would recommend this comforter set. This came in yesterday & immediately put on my grandson's twin bed. Instant gratification guys!!!!! He loves sharks and it is good quality material ....i am very pleased. So glad I bought this for his room..it looks awesome! The pillows look adorable! I love this comforter set. Bought for bunk beds at the beach house and goes perfect in the kid's room! This is adorable! I am really happy with the look. I think this is a great bed set for an older child. My son enjoys it because it is not 'baby-ish'. Also, the throw pillows are included and are very well made. I love the pattern and the colors. They are identical to your photos. It will be perfect for my 3 year old grandson. It isn’t too babyish. The only thing I would change is the corners are sticking out. I haven’t washed it yet so hopefully they will relax after I do. I bought this set for my 4 year old grandson. He is nuts over sharks and was very excited when this was put on his bed. Machine washable, good quality, it"s a boy thing! Very cute. Material is decent quality. I like that it is reversible. Extra pillows are nice. Not to thick. My son loved it. Looks great in his room. My son loves his new bedding set! It is very cute! I would have given it a 5 but the stitching wasn’t great on the shark pillow but only noticeable up close. Purchased this for my grandson. It is really cute but not babyish! Nice for the money! "Did this wash well? I have bought comforters online in the past and after washing the batting material bunches up and makes the comforter bumpy. Thanks!" It will wash well if you are using a large capacity Washer / Dryer to allow the comforter enough free movement. I liked the unique style and reasonable price.